Want more guitar students? Stop revealing your guitar lesson rates in your advertisements. This mistake is one of the ways way to make potential guitar students disinterested in taking lessons with you. This results in you not getting many students and struggling to fill your teaching schedule. Listing your price in your ads makes potential students focus on the cost of lessons rather than the results they want to get in their playing. This turns guitar lessons into a commodity for them, so they simply look for whoever is cheaper. Focus instead on demonstrating the value you can deliver to students, the problems you can solve for them and the way you can enhance their musical lives. This makes students more inspired to call you and gives you the chance to explain why you are the best choice for them. Want to learn more ways to attract a lot more guitar students fast? 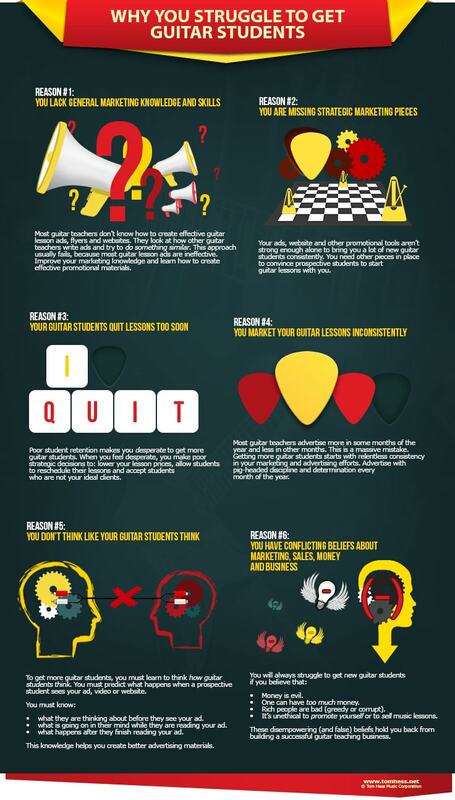 Read these guitar teaching business tips to learn six key questions you need to ask yourself to fill your teaching schedule and become the #1 guitar teacher in your area. Learn how to fill your guitar teaching schedule with students.